Cosmetic dentistry is an art, and while many dentists claim they have expertise in porcelain veneers and crowns, few achieve the unparalleled results of Southlake cosmetic dentist Dr. James Holt. Dr. Holt achieves stunning smiles through a mastery of techniques with more than 20-plus years of experience in cosmetic dentistry, the highest level of continuing education, and a fellowship degree of aesthetic dental design. 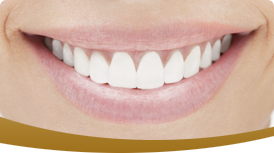 When planning a porcelain veneer treatment, painstaking consideration goes into the selection of dentin color control, bonding, preparation design, porcelain veneer selection and color of cementation. Dr. Holt discusses your face shape, the size of teeth that match your bone structure and the correctly shaped veneer to match your existing teeth in order to create the perfect smile customized for you. Together with his world-renowned lab specialist, Dr. Holt crafts your veneers with an artisan’s touch; his method is incomparable.